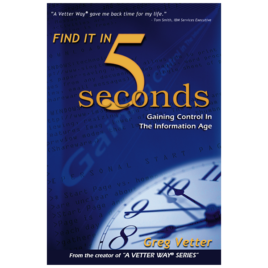 Find It In 5 Seconds | Vetter Productivity, Inc.
ARE YOU DROWNING IN A SEA OF INFORMATION? You’re not the only one. 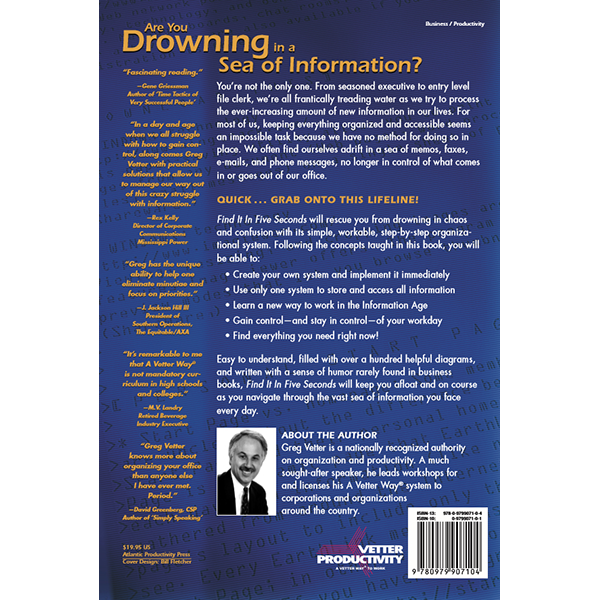 From seasoned executive to entry-level file clerk, we’re all frantically treading water as we try to process the ever-growing tide of information in our lives. For most of us, keeping everything organized and accessible seems an impossible task because we have no method for doing so in place. We often find ourselves adrift in a sea of memos, faxes, e-mails, and phone messages, no longer in control of what comes in or goes out of our office. 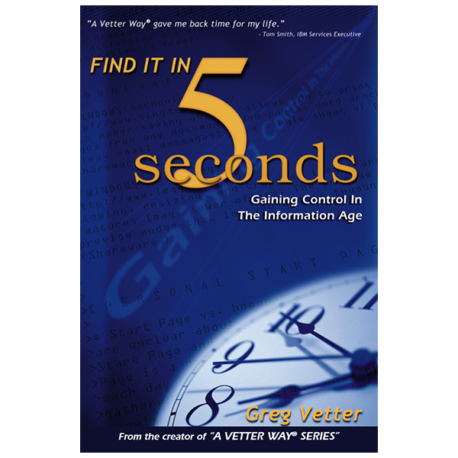 Greg Vetter describes this dramatic turn of events in the American workplace in his book, “Find It In 5 Seconds”. 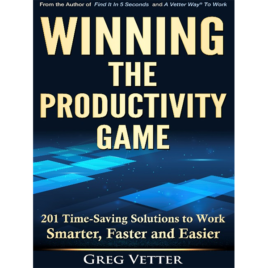 Greg explains how employees are working harder but actually accomplishing less. Without the correct system for handling the deluge of information, they’re drowning in e-mail, voice mail, faxes and cellular phone calls. 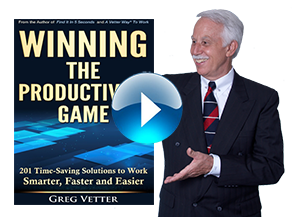 Find It In 5 Seconds will rescue you from drowning in chaos and confusion with its simple, workable, step-by-step organizational system. 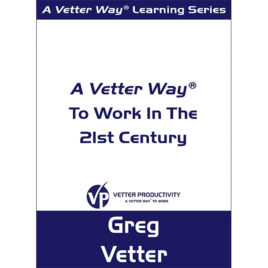 A basic system of how to work in the office– something that few people have been taught. 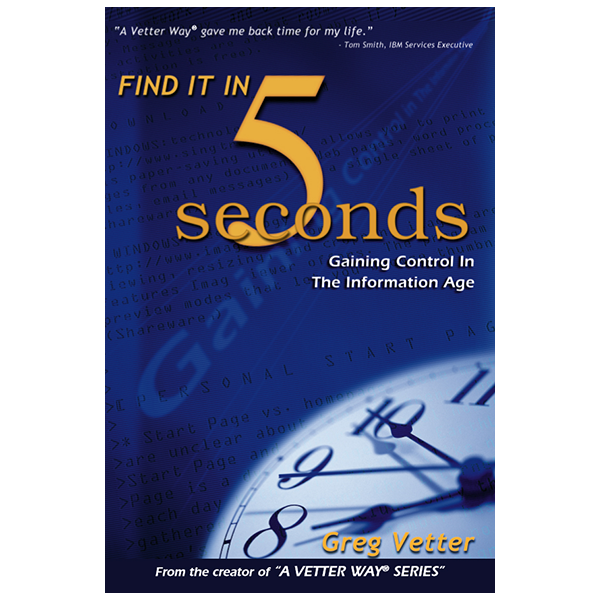 Easy to understand, filled with over a hundred helpful diagrams, and written with a sense of humor rarely found in business books, Find It In 5 Seconds will keep you afloat and on course as you navigate through the vast sea of information you face every day.